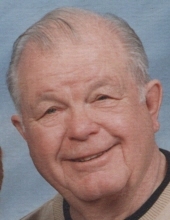 Roger Fred Voigt, age 87, of Sheboygan Falls, WI, passed away early Wednesday morning (March 27, 2019) at Pine Haven Nursing Home. He was born on October 28, 1931 in the Town of Schleswig, WI, a son of the late Edwin and Anna (Maurer) Voigt. Roger graduated from Kiel High School in 1950. He was a veteran of the United Sates Army, serving his country from 1952 to 1954. On February 19, 1955 he married Patricia “Pat” Roepke in Kiel, WI. He was employed at Kohler Company for 39 years, most of them as a supervisor in the Enamel Shop until his retirement in 1993. The couple then moved permanently to Shawano, WI. They loved to travel during their retirement and enjoyed visiting Alaska and other National Parks. Roger and Pat loved their Green Bay Packers and were season ticket holders since 1959. He loved to regale others with stories of the early Packer games, especially the Ice Bowl, when he joined others on Lambeau Field to help pull down the goal posts. In the summer, he loved sitting outside listening to the Brewers on the radio. He enjoyed fishing and hunting with his sons, brothers, nephews, and friends although the comradery was what meant the most to him. He especially enjoyed fishing trips to Canada. Roger also loved gardening and took great time and patience in caring for their flowers. He was a skilled winemaker and loved sharing his wines with others. His wife preceded him in death on July 16, 2012. He is survived by his three sons; Gregg (Jamie Utschig) Voigt, Brian (Kerry) Voigt and James (Ann) Voigt all of Sheboygan Falls, WI, Grandchildren; Heather (Andy) LaPoint of Fond du Lac, Gage Voigt ; Lindsey (Utschig Hunt) of Portland, OR, Jon (Utschig Hunt) of Milwaukee, One great grandson: Liam LaPoint. He is also survived by many nieces, nephews, other relatives and many friends. Memorial services will be held on Saturday (March 30, 2019) at 12:00 Noon at the Suchon Funeral Home in Plymouth. Rev. Beth Petzke, pastor of Grace United Church of Christ in Kohler will officiate. Inurnment will be in the Greenlawn Memorial Park in the Town of Sheboygan. Visitation will be from 10:00 A.M. on Saturday at the Suchon Funeral Home until the time of services. In lieu of flowers, a memorial fund is being established in Roger’s name for Pine Haven Nursing Home and the Sharon S. Richardson Hospice in Sheboygan Falls. The family would like to thank the staff of Pine Haven Nursing Home and the Sharon S. Richardson Hospice Care for their loving support. Everyone was generous with their patience and kindness to Roger and his family. To send flowers or a remembrance gift to the family of Roger F. Voigt, please visit our Tribute Store. "Email Address" would like to share the life celebration of Roger F. Voigt. Click on the "link" to go to share a favorite memory or leave a condolence message for the family.